Over the past two decades, governments have delegated extensive regulatory authority to international private-sector organizations. This internationalization and privatization of rule making has been motivated not only by the economic benefits of common rules for global markets, but also by the realization that government regulators often lack the expertise and resources to deal with increasingly complex and urgent regulatory tasks. 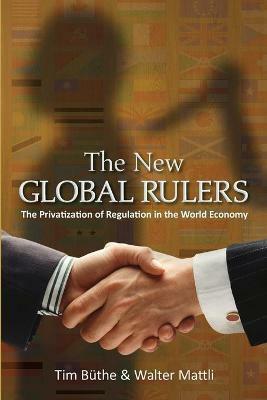 The New Global Rulers examines who writes the rules in international private organizations, as well as who wins, who loses--and why. Tim Buthe and Walter Mattli examine three powerful global private regulators: the International Accounting Standards Board, which develops financial reporting rules used by corporations in more than a hundred countries; and the International Organization for Standardization and the International Electrotechnical Commission, which account for 85 percent of all international product standards. Buthe and Mattli offer both a new framework for understanding global private regulation and detailed empirical analyses of such regulation based on multi-country, multi-industry business surveys. They find that global rule making by technical experts is highly political, and that even though rule making has shifted to the international level, domestic institutions remain crucial. Influence in this form of global private governance is not a function of the economic power of states, but of the ability of domestic standard-setters to provide timely information and speak with a single voice. Buthe and Mattli show how domestic institutions' abilities differ, particularly between the two main standardization players, the United States and Europe. Illustrations note 13 halftones. 9 line illus. 20 tables. Tim Buthe is associate professor of political science and a senior fellow of the Rethinking Regulation Center at Duke University. Walter Mattli is professor of international political economy and a fellow of St. John's College, University of Oxford. His books include The Politics of Global Regulation (Princeton).